According to numerous reports, Apple is preparing to launch a new version of its Apple TV box along with the iPad 3 next week. Now, developer Benjamin Mayo is adding a bit of information from ‘sources familiar with the matter’, in that the new device will be available ‘immediately’ on March 7th or March 8th. This matches claims that Apple has been delaying shipments of the existing Apple TV to retailer partners, presumably in preparation for a new model to make an appearance. An earlier report, from 9to5Mac’s Mark Gurman, also claimed that we would also be seeing a new Apple TV box to go along with the iPad announcement next week. He even has a part number ‘MD199LL/A – J33 BEST -USA’ to go along with the whispers. While there is no official confirmation of his report yet, it does make some sense. With a higher resolution screen, the new iPad would be able to do 1080P footage justice and then some. As MG Siegler points out, the existing Apple TV is limited to 720P, making it a mismatch for the newer, beefier iPad’s display. But Gurman also says that the site’s sources are telling them about a ‘mystery accessory’ that is called “B82” internally. There is no indication of what the item is, outside of the fact that it’s an accessory. We feel, however, that the conjecture of an improved remote for the Apple TV might very well be accurate. 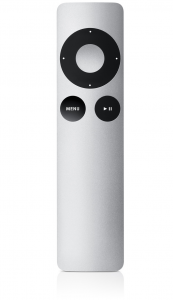 The current Apple TV remote isn’t anything to write home about. It’s a thin lozenge that gets the job done, but its limited buttons and line-of-sight IR connectivity aren’t exactly top notch. In his biography, Steve Jobs alluded to the fact that he had figured out how to solve the problem of an ‘integrated’ television. A remote for the ‘next generation’ of Apple TVs, including a full-on television, would have a modal interface that transforms it into any type of remote you need for the situation, a small microphone to activate voice control, an interface that is incredibly familiar to any user of any smartphone and the ability to present content channels directly as ‘apps’. Of course, there is always the possibility that this mystery accessory is just something silly like a new dock. Or perhaps the same remote, but with Bluetooth 4.0 connectivity instead of infrared. In which case we’d end up with the same crappy remote, but without the IR window. Regardless of the remote though, it seems very likely that we’re going to see a new Apple TV box next week that supports higher resolution video streaming up to 1080P and AirPlay compatibility with the iPad 3’s higher-resolution screen. Sounds good to me, even if it uses a remote that looks like this.